To start with there's the ‘Bird Watching in Argyll’ section. To start with there are the Birdwatching on Islay and Jura pages, while the ‘General Info’ section seems to be incomplete as of writing this there's a lot of helpful information on the Where to watch birds in Islay and Jura, Scotland page. Other areas covered include Colonsay and Kintyre and Gigha. I believe they are quite helpful to people new to the area. 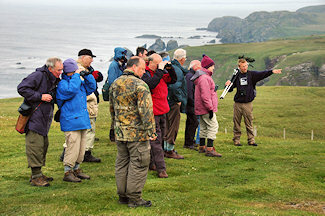 Among their trip reports I found this interesting report with many pictures: Spring meeting and Field Trip - Isle of Islay - 24 to 26 May 2009. The photo galleries also include a few pictures from Islay, in 2009 I spotted some on September 2009, July 2009 and April 2009, just to pick a few. PS: No, the picture isn't of the Argyll Birds Club. It's of a bird walk on The Oa on Islay with the RSPB. Only nice picture of birdwatching I could think of in my collection and I thought it would be nice to have a picture of birdwatching with this entry. That's all.